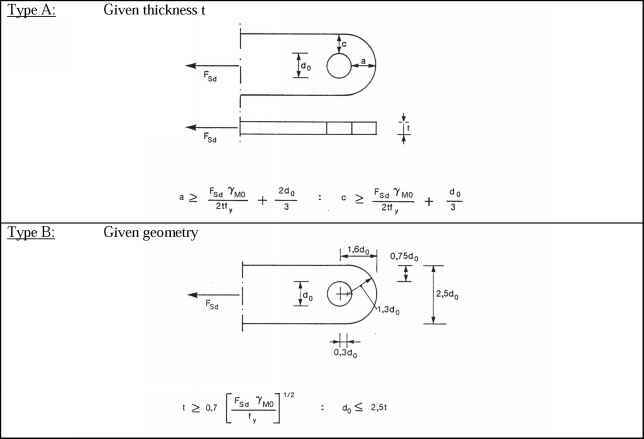 (2) The methods given in 6.2.7 for determining the design moment resistance of a joint HjR do not take account of any co-existing axial force NEd in the connected member. They should not be used if the axial force in the connected member exceeds 5% of the design plastic resistance A^c^a of its cross-section. MjjRA is the design moment resistance of the joint, assuming no axial force; ^j.Rd is the axial design resistance of the joint, assuming no applied moment. (4) The design moment resistance of a welded joint should be determined as indicated in Figure 6.15(a). (5) The design moment resistance of a bolted joint with a flush end-plate that has only one bolt-row in tension (or in which only one bolt-row in tension is considered, see 6.2.3(6)) should be determined as indicated in Figure 6.15(b). (6) The design moment resistance of a bolted joint with angle flange cleats should be determined as indicated in Figure 6.15(c). (7) The design moment resistance of a bolted end-plate joint with more than one row of bolts in tension should generally be determined as specified in 6.2.7.2. (8) As a conservative simplification, the design moment resistance of an extended end-plate joint with only two rows of bolts in tension may be approximated as indicated in Figure 6.16, provided that the total design resistance ARd does not exceed 3,8AtRd , where AtRd is given in Table 6.2. In this case the whole tension region of the end-plate may be treated as a single basic component. Provided that the two bolt-rows are approximately equidistant either side of the beam flange, this part of the endplate may be treated as a T-stub to determine the bolt-row force A1Rd . The value of A2Rd may then be assumed to be equal to Ai,Rd , and so ARd may be taken as equal to 2A\,Rd . (9) The centre of compression should be taken as the centre of the stress block of the compression forces. As a simplification the centre of compression may be taken as given in Figure 6.15. (10) A splice in a member or part subject to tension shall be designed to transmit all the moments and forces to which the member or part is subjected at that point. (11) Splices shall be designed to hold the connected members in place. Friction forces between contact surfaces may not be relied upon to hold connected members in place in a bearing splice. (12) Wherever practicable the members should be arranged so that the centroidal axis of any splice material coincides with the centroidal axis of the member. If eccentricity is present then the resulting forces should be taken into account.